A crowd of motorcyclists roar along an avenue in central Bogotá. 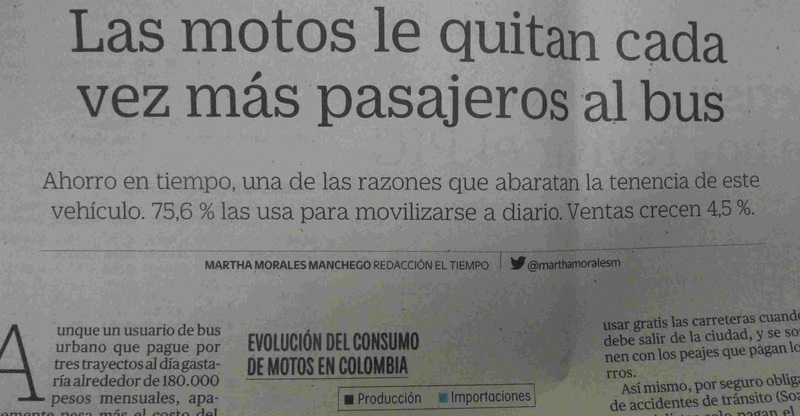 Bogotá is becoming inundated with motorcycles. For their riders, they provide an alternative to having to wait for buses or idle in traffic jams. But for cities they create problems including crime, traffic chaos and a weakened mass transit system. A motorcycle belches out white smoke. Motorcyclists are also linked to crime. I myself was once mugged by a group of young men on motorcycles. And official concern was so much that several months ago Bogotá banned male motorcyclists from carrying other males as passengers. A motorcycle club rally in La Candelaria. Most Bogotá motorycles are smaller, newer and more practical. passengers from mass transit. If mass transit ridership drops far enough – and that’s already happening in Bogotá – it will make mass transit economically inviable, reducing its availability and pushing even more people to cars and motorcycles and worsening Bogotá’s terrible traffic. Motorcycles are involved in a dosproportionate number of accidents and injuries.